The protests in Saudi Arabia were part of the Arab Spring that started with the 2011 Tunisian revolution. Protests started with a self-immolation in Samtah and Jeddah street protests in late January 2011. Protests against anti-Shia discrimination followed in February and early March in Qatif, Hofuf, al-Awamiyah, and Riyadh. A Facebook organiser of a planned 11 March "Day of Rage", Faisal Ahmed Abdul-Ahad, was allegedly killed by Saudi security forces on 2 March, with several hundred people protesting in Qatif, Hofuf and al-Amawiyah on the day itself. Khaled al-Johani demonstrated alone in Riyadh, was interviewed by BBC Arabic Television, was detained in `Ulaysha Prison, and became known online as "the only brave man in Saudi Arabia". Many protests over human rights took place in April 2011 in front of government ministry buildings in Riyadh, Ta'if and Tabuk and in January 2012 in Riyadh. In 2011, Nimr al-Nimr encouraged his supporters in nonviolent resistance. Anti-government protests demanding release of prisoners held without charge or trial continued in April and May 2011 in Qatif, al-Awamiyah and Hofuf in the Eastern Province, and extended to calls for the Peninsula Shield Force to be withdrawn from Bahrain and for the Eastern Province to have a constitution and a legislature. Four protesters were shot dead by Saudi authorities in late November in Qatif region protests and funerals, two on 12/13 and 26 January 2012, and two on 9 and 10 February 2012. In the early 2012 demonstrations, protesters chanted slogans against the House of Saud and Minister of Interior, Nayef, calling Nayef a "terrorist", "criminal" and "butcher" and throwing an effigy of Nayef at tanks. Police described two of the fatal shootings as responses to unidentified gunmen who had shot first. Eastern Province protests intensified after Sheikh Nimr al-Nimr was wounded in the leg and arrested by police on 8 July. Four men were killed in a protest immediately following the arrest, and on 13 July, with several funerals and protests following, including calls for the downfall of the House of Saud. While detained, al-Nimr was tortured and started a hunger strike, he was later executed in the 2016 mass execution. Protest organisers insisted on the use of nonviolent resistance and called for all Shia and Sunni detainees to be freed. A protester and a soldier were fatally shot in Qatif during a 3–4 August protest, leading to more protests. Protests and sit-ins calling for political prisoners to be released spread beyond the Eastern Province to protests at the Ministry of Interior in Riyadh on 20 March and in Riyadh and Buraidah in December 2011, and in July and August 2012 in front of the Ministry in Riyadh, in Mecca in Ta'if, in Buraidah, and near al-Ha'ir Prison. Women organised a Facebook women's suffrage campaign called "Baladi", stating that Saudi Arabian law gives women electoral rights. In April 2011, women in Jeddah, Riyadh and Dammam tried to register as electors for the 29 September municipal elections despite officials stating that women could not participate. In May and June, Manal al-Sharif and other women organised a women's right-to-drive campaign, with the main action to take place on 17 June. In late September, Shaima Jastania was sentenced to 10 lashes for driving in Jeddah, shortly after King Abdullah announced women's participation in the 2015 municipal elections and eligibility as Consultative Assembly members; King Abdullah overturned the sentence. Al-Sharif and Samar Badawi filed lawsuits against Saudi authorities in the Grievances Board, a non-Sharia court, because of the rejection of their driving licence applications. Women university students protested in King Khalid University (KKU) in Abha in March 2012 and were attacked by security forces, leading to one death. Other university protests followed in Taibah University in Medina and Tabuk University in March and April. KKU students called for the university president to be dismissed. He was replaced on 1 July 2012. Protests started with a 65-year-old man's self-immolation in Samtah, Jizan on 21 January and protests of a few hundred people in late January in Jeddah, triggered by flooding, and several times throughout February and early March in the cities of Qatif, al-Awamiyah, Riyadh, and Hofuf. A "Day of Rage" was planned for 11 March. One of the main organisers, Faisal Ahmed Abdul-Ahad (or Abdul-Ahadwas), was alleged to have been killed by Saudi security forces on 2 March, by which time one of the Facebook groups discussing the plans had over 26,000 members. On 11 March, several hundred people protested in Qatif, Hofuf and al-Amawiyah. Khaled al-Johani demonstrated in Riyadh despite a massive police presence, was interviewed by BBC Arabic Television, and has since then been detained in ‘Ulaysha Prison. Al-Johani became known online as "the only brave man in Saudi Arabia". The Saudi Civil and Political Rights Association (ACPRA) and the Saudi organisation Human Rights First Society called for ACPRA co-founder Mohammed Saleh Albejadi to be released following his arbitrary arrest in Buraidah on 21 March by Mabahith, the internal security agency. In April, several small protests over labour rights took place in front of government ministry buildings in Riyadh, Ta'if and Tabuk. Protests, made up mainly of Shia protesters, continued in late March and April in Qatif and smaller cities in the Eastern Province such as al-Awamiyah, and Hofuf. The protesters called for the release of prisoners, for the Peninsula Shield Force to be withdrawn from Bahrain, for equal representation in key offices and for reforms in political positions, as they feel marginalised. In response to the 22–23 March announcement of men-only municipal elections in late September 2011 to elect half the members of local councils, women organised a Facebook women's suffrage campaign called "Baladi", stating that Saudi Arabian law gives women electoral rights. In April, women in Jeddah, Riyadh and Dammam tried to register as electors for the 22 September municipal elections despite officials stating that women could not participate. Poster for the Saudi Arabia's women to drive movement, artwork by Carlos Latuff. In May and June, motivated by the Arab Spring, Manal al-Sharif and other women organised a women's right-to-drive campaign, with the main action to take place on 17 June. Al-Sharif drove a car in May and was detained on 22 May and from 23‒30 May. Other women also drove cars, including actress Wajnat Rahbini, who was arrested after driving in Jeddah on 4 June and released a day later. From 17 June to late June, about seventy cases of women driving were documented. In late September, Shaima Jastania was sentenced to 10 lashes for driving in Jeddah, shortly after King Abdullah announced women's participation in the 2015 municipal elections and eligibility as Consultative Assembly members. King Abdullah cancelled the sentence. From 17 June to late June, more than seventy cases of women driving were documented. Protests in the Qatif region continued in May and in October protests, police shot live ammunition at protesters. The protesters called for Eastern Province to have its own constitution and legislative assembly, and for their association Society for Development and Change to be legally registered. In late November, Nasser al-Mheishi, Ali al-Felfel, Munib al-Sayyed al-'Adnan and Ali Abdullah al-Qarairis were shot dead by security forces in the Qatif region in successive protests and funerals. The protests continued in December. Hundreds of people protested in Riyadh and Buraidah in December, calling for the release or trial of prisoners. A protest for labour rights took place in Riyadh on 14 January and a sit-in calling for the Syrian Ambassador to be expelled occurred on 5 February in Jeddah. Protests in the Qatif region continued from January to May, with security forces using live fire against protesters, killing four, and arresting medical personnel. Security forces shot dead Issam Mohamed Abu Abdallah in al-Awamiyah on 12 or 13 January, Montazar Sa'eed al-Abdel in al-Awamiyah on 26 January, and Munir al-Midani and Zuhair al-Said on 9 and 10 February. In the 70,000 strong funeral for Abdallah on 16 January in al-Awamiyah and the daily Qatif region protests that followed, protesters chanted slogans against the House of Saud and Minister of Interior, Nayef, Crown Prince of Saudi Arabia. In mid-February, two medical personnel were arrested for having clandestinely treated injured protesters. In a 10 February protest and a 13 February funeral, an effigy of Nayef was thrown at tanks and participants described Nayef as a "terrorist", "criminal" and "butcher". Police described two of the fatal shootings as responses to unidentified gunmen who had shot first. Dawoud al-Marhoon and Abdullah Hasan al-Zaher were arrested on 22 May and 3 March 2012, when they were aged 17 and 16 respectively, for participated in the 2011–12 Saudi Arabian protests. Originally, in March 2012, Al Marhoon was questioned by Saudi police and asked to be an informant and report details about his fellow protesters. After he refused, Saudi security forces arrested him from the Dammam Central Hospital, where he was undergoing treatment for an eye injury sustained in a traffic accident. Saudi forces surrounded the hospital and arrested him as he prepared for surgery. He was arrested in May 22, 2012, and have been tortured and forced to "confess". Then sentenced to death by the Specialized Criminal Court in September 2015, and as of 23 September 2015[update], awaited ratification of his sentence by King Salman of Saudi Arabia, to be carried out by beheading and crucifixion (in that order). Manal al-Sharif and Samar Badawi, active in the women to drive movement, announced that they had filed lawsuits against Saudi authorities in the Grievances Board, a non-Sharia court, because of the rejection of their driving licence applications. As of the end of June 2012, 100 Saudi women had started driving regularly since the June 2011 campaign launch. Women university students protested in King Khalid University in Abha in March and were attacked by security forces, leading to one death. Other university protests followed in Taibah University in Medina and Tabuk University in March and April. In July 2012, Amnesty International protested in the United Nations Human Rights Council against legal persecution of Saudi Civil and Political Rights Association (ACPRA) leaders. Ten female activists were detained in a Buraidah 14 July protest calling for political prisoners to be freed. Similar protests calling for prisoners to be freed and protesting against the Saudi government occurred in Buraidah on 23 July and in front of the Ministry of Interior in Riyadh on 25 July, in Riyadh and Mecca on 28 July, in Ta'if. in Buraidah, near al-Ha'ir Prison and in Dammam in August. In July and August 2012, protests in the Qatif region intensified after Sheikh Nimr al-Nimr was wounded in the leg and arrested by police on 8 July. Three men were killed in a protest on the evening of the arrest. Funerals and protests took place on 10 July, 11 July and 13 July, including chants calling for the downfall of the House of Saud. Another protester was shot dead in 13 July al-Awamiyah protest. While detained, al-Nimr was tortured, had bruises on his face and broken teeth, and started a hunger strike. Protest organisers in al-Awamiyah stated their support for al-Nimr and insisted on the use of nonviolent resistance. Protester Mohamed al-Shakhouri was shot in the back and neck and arrested in a 26–27 July protest calling for al-Nimr's release. Further protests called for all Shia and Sunni detainees to be freed, including al-Shakhouri. A protester and a soldier were fatally shot in Qatif during a 3–4 August evening human rights protest, leading to several more protests. In early 2014, conflict between protesters and the security forces continued, with Qatif being "a militarised zone, surrounded by checkpoints and armoured vehicles". A Saudi journalist who had been documenting the protests for two years for the BBC left Saudi Arabia as she judged the situation "too risky for [her] to continue investigating." Nimr al-Nimr was sentenced to death by the Specialized Criminal Court on 15 October 2014 for "seeking 'foreign meddling' in [Saudi Arabia], 'disobeying' its rulers and taking up arms against the security forces". His brother, Mohammad al-Nimr, was arrested on the same day for tweeting information about the death sentence. Al-Nimr was executed on or shortly before 2 January 2016, along with 46 others in a mass execution. His execution was condemned by Iran and Shiites throughout the Middle East, as well as by Western figures and Sunnis opposed to sectarianism. The Saudi government said the body would not be handed over to the family. In March 2017, after a long campaign of harassment, the Saudi security forces killed two members of Nimr family during a raid on a farm in eastern Saudi Arabia. Miqdad and Mohammad Al-Nimr were killed at a farm in Awamiyah, the Nimr family hometown. al-Nimr was very critical of the Saudi Arabian government, and called for free elections in Saudi Arabia. In November 2014, unknown assailants in al-Ahsa governorate in the Eastern Province attacked a procession during Ashoura and killed eight Shias, including children, and left over 30 people wounded. The following week deputy governor of the province, Emir Jalwi bin Abdulaziz, was sacked by a royal decree and transferred to the Najran region. However, no official reason was given. Protests in the Qatif region continued during 2017–19, with deaths of protestors and security forces. (Administrator of Facebook group calling for 11 March "Day of Rage", according to DPA) 27 Riyadh Before 2 March 2011 Shot by the Saudi security forces, who removed his body to "hide evidence of the crime". Nasser al-Mheishi (or Nasir al-Muhaishi) 19 Al-Shweika 20 November 2011 Shot by the police during a protest. Ali al-Felfel 24 Al-Shweika 21 November 2011 Shot in the chest by police during a funeral for Nasser al-Mheishi. Munib al-Sayyed al-Adnan 20 Al-Shweika 23 November 2011 Shot in the head by police during protest over al-Mheishi and al-Felfel killings. Ali Abdullah al-Qarayrees 26 Al-Awamiyah 23 November 2011 Shot by police during protest over al-Mheishi and al-Felfel killings. Issam Mohamed Abu Abdallah 22 Al-Awamiyah 12 January 2012 Shot by security forces during protest. Montazar Sa'eed al-Abdel Al-Awamiyah 26 January 2012 Shot by security forces during protest. Muneer al-Midani 21 Al-Shweika 9 February 2012 Shot in the heart by security forces during protest. Zuhair al-Said (or Zaheer Abdullah Saeed) 21 Al-Awamiyah 10 February 2012 Shot in the stomach by security forces during protest, died in hospital. Hajer al-Yazidi Abha 7 March 2012 Epileptic student injured in head during protest, died of head wound. Akbar Hassan al-Shakhouri 31 Al-Awamiyah 8 July 2012 Shot by security forces during protest over the arrest of Nimr al-Nimr. Mohamed Redha al-Felfel 18 Al-Awamiyah 8 July 2012 Shot by security forces during protest over the arrest of Nimr al-Nimr. Abdallah Jaafar al-Ojami 18 Al-Awamiyah 13 July 2012 Shot by security forces near a police station during protest. Hussain Yusuf al-Qallaf 18 Tarout Island 4 August 2012 Shot in the chest by security forces during protest on 3 August, died of injuries on 4 August. Khaled Abdulkarim al-Labad 26 Al-Awamiyah 26 September 2012 Shot in the head by security forces while authorities were trying to arrest him, he was one of 23 opposition activist accused of organising protests in Qatif. Mohammed Habib al-Mnasif 16 Al-Awamiyah 26 September 2012 Shot by security forces while authorities were trying to arrest Khaled Abdulkarim al-Labad. Hassan Mohammad Zaheri 16 Al-Awamiyah 28 September 2012 Shot by security forces while authorities were trying to arrest Khaled Abdulkarim al-Labad on 26 September, died of injuries on 28 September. Ahmad al-Matar 18 Tarout Island 28 December 2012 Shot by security forces during protest over the detention of prisoners. Ali Hassan al-Mahroos 19 Qatif 21 June 2013 Shot in his car by a stray bullet by police when they fired at another person on a motorbike. Hussein Bawah Ali Zabani 20 or 21 Al-Malha 4 August 2012 Shot by "rioters on a motorbike" in Qatif according to Ministry of Interior spokesperson Mansour al-Turki. On 21 January 2011, an unidentified 65-year-old man died after setting himself on fire in the town of Samtah, Jizan. This was apparently the kingdom's first known case of self-immolation. On 21 November 2011, a 9-year-old girl was shot dead in a demonstration in Qatif along with Ali al-Felfel, during the funeral for Nasser al-Mheishi. On 8 July 2012, an unidentified demonstrator was killed by the security forces along with Akbar Hassan al-Shakhouri and Mohamed Redha al-Felfel, during a protest against the arrest of Nimr al-Nimr by the Saudi authorities. On 10 September 2012, a Bangladeshi man was shot dead in the Al-Awamiyah district of eastern Saudi Arabia. Saudi police said that the Bangladeshi man was driving when his car was hit by bullets fired at two security patrol cars. However, an activist in Al-Awamiyah gave a different account of the incident, saying the man had been killed by gunfire when security forces stormed a house while trying to arrest one of the 23 wanted activist for organising protest in Qatif. On 10 February 2011, a Reuters report claimed that 10 intellectuals, human rights activists and lawyers came together to create the Umma Islamic Party – considered to be the first political party in Saudi Arabia since the 1990s – to demand the end of absolute monarchy in the country. On 18 February however, all ten members of the party were arrested and ordered to withdraw demands for political reform in exchange for their release. On 23 February, Saudi Arabia's King Abdullah, after returning to the country following three months spent abroad for health treatment, announced a series of benefits for citizens amounting to $10.7 billion. These include funding to offset high inflation and to aid young unemployed people and Saudi citizens studying abroad, as well as writing off some loans. State employees' incomes were increased by 15 percent and new housing loans subsidies were introduced. No political reforms were announced as part of the package, though the 86-year-old monarch did pardon some prisoners indicted in financial crimes. On 6 March, the Saudi Arabian Council of Senior Scholars, headed by Grand Mufti Abd al-'Aziz al-Ashaikh, issued a fatwā (religious opinion) opposing petitions and demonstrations, declaring, "Therefore the council hereby reaffirms that only the reform and [counsel] that has its legitimacy is that which may bring welfare and avert the evil, whereas it is illegal to issue statements and take signatures for the purposes of intimidation and inciting the strife. ... reform should not be by demonstrations and other means and methods that give rise to unrest and divide the community. ... The Council affirms prohibition of the demonstrations in this country and [that] the legal method which realizes the welfare without causing destruction rests on the mutual advice." The fatwa included a "severe threat against internal dissent", stating, "[The Prophet] again said: 'He who wanted separate affairs of this nation who are unified, you should kill him with sword whoever he is' (narrated by Muslim)." In late March, Abd al-'Aziz al-Ashaikh called for a million copies of the fatwa to be printed and distributed. On 22–23 March 2011, officials of the Ministry of Municipal and Rural affairs announced that men-only municipal elections to elect half the members of local councils would be held in September 2011. Associated Press described the election announcement as having "coincided with rumblings of dissent in Saudi Arabia stemming from the wave of political unrest in the Arab world." About 30 to 50 people were arrested following 29 January Jeddah demonstration. On 18 February, the ten founding members of the Umma Islamic Party were arrested and ordered to withdraw demands for political reform in exchange for their release. According to a Deutsche Presse-Agentur report on 2 March, Saudi activists have alleged that one of the main administrators of one of the Facebook groups calling for a "Day of Rage" on 11 March, Faisal Ahmed Abdul-Ahad (or Abdul-Ahadwas), was killed by Saudi security forces, who removed his body to "hide evidence of the crime". On 5 March, thousands of security forces were sent to the north-east, causing delays on the road to Dammam. On the same day, following about two weeks of small protests in the eastern part of Saudi Arabia, the Ministry of the Interior warned that the "ban [on] all sorts of demonstrations, marches, sit-ins" imposed by Saudi law would be enforced. On 9 March, Foreign Minister Saud Al Faisal stated that the government would not tolerate any street protests against it, while also saying that the "best way to achieve demands is through national dialogue". On 21 March, Saudi Civil and Political Rights Association (ACPRA) co-founder Mohammed Saleh Albejadi (also Al-Bjady) was arrested in Buraidah by Mabahith, the internal security agency. ACPRA stated that the arrest was arbitrary, in violation of the Basic Law of Saudi Arabia and the Law of Criminal Procedures. Both the ACPRA and Human Rights First Society called for his immediate, unconditional release. On 27 March 2011, Human Rights Watch estimated that the "scale of arrests [rose] dramatically during the preceding two weeks", up to about 160 protesters and critics being held without charge. In early January 2012, Saudi authorities published the names of a list of 23 people who were allegedly involved in the October 2011 Awamiyah/Qatif protests, calling for their arrests. Ministry of Interior spokesman Mansour al-Turki alleged that the protesters "were working according to a foreign agenda" and were "sponsored financially or supplied with weapons and were working as part of an organization". Shah Ali al-Shokan (or Shaukan) from Tarout Island, one of the 23, was arrested by Mabahith on 2 January 2012. Hussain Ali Abdullah al-Baraki, Mosa Ja'far Mohammad al-Mabyouq, and two others among the 23 were also arrested on 2 January. The Ministry of Interior claimed that al-Shokan, al-Baraki and al-Mabyouq had turned themselves in voluntarily. On 10 January, Aqeel al-Yaseen was wounded in al-Awamiyah by security forces, arrested and transferred to a Mabahith facility in Dammam, and forbidden family visits. In mid-March 2011, Reuters chief correspondent in Saudi Arabia, Ulf Laessing, who had reported from Riyadh since 2009, had his journalistic accreditation withdrawn because of his reporting on the early 2011 Saudi Arabian protests, effectively forcing him to leave Saudi Arabia. One of the subsequent responses of the Saudi government was the arrest, conviction and subsequent execution of Nimr al-Nimr on 2 January 2016. Russia – On 12 July 2012, K.K. Dolgov, human rights representative of the Russian Ministry of Foreign Affairs, expressed "great concern" about the July events in the Eastern Province. He stated, "We expect that the authorities of the Kingdom will undertake all necessary measures to settle the situation in its eastern regions, to avoid conflict, including confrontation on interconfessional basis, and to ensure the observance of conventional human rights, including the right for freedom of expression of opinion, peaceful demonstrations and freedom of associations, as it is prescribed by the law." United States – On 8 March 2012, the United States Department of State awarded Samar Badawi the 2012 International Women of Courage Award, citing her filing of a lawsuit for women's voting rights in the September 2011 Saudi Arabian municipal elections and her encouragement of other women by the launching of an online campaign. Australia – On 19 July 2012, 50 people protested in front of the Saudi Arabian Embassy in Canberra against the arrests of the Bahraini uprising, against "the crackdown happening in the eastern region of Saudi Arabia", and "to support the people seeking freedom of speech, seeking human rights, freedom for women". Canada – On 21 July 2012, 30 people protested in front of the United States (US) Embassy in Toronto against US support of the Saudi Arabian government. A protest organiser claimed that the Saudi government was hypocritical because "Saudi Arabia says [it] support[s] Syria's push for freedom [in the Syrian uprising], but [it] repress[es] [its] own citizens". He called for the release of Nimr al-Nimr. Journalist Robert Fisk said that the protests were known as the "Hunayn Revolution,"[by whom?] after the Battle of Hunayn fought between Muhammad and the Hawazin. Exiled Saudi physicist and political dissident Mohammad al-Massari described police attacks on women in 3 March 2011 Qatif demonstration as a strategic error, saying, "They made a stupid mistake by attacking women and so on because they think Shia women do not have ... the honor protection like the rest of the women in the country. But attacking women in Saudi Arabia, in an Islamic country is very severe, very negative and catastrophic ... and this will have dire repercussions." On 21 February 2011, oil prices rose in response to the 2011 Libyan civil war and speculation regarding 11 March Saudi Arabian Day of Rage. The Saudi Tadawul stock market index fell to a seven-month low on stability concerns. During the week of 27 February, global stock prices fell as oil prices increased and silver reached a 30-year high price on stability concerns in the region. Regional stock market indices also fell on concern for Saudi stability. In August 2017, ten Nobel Peace Prize laureates, including Desmond Tutu and Lech Wałęsa, urged Saudi Arabia to stop the executions of 14 young people for participating in the 2011–12 Saudi Arabian protests. ^ Laessing, Ulf; Alsharif, Asma (5 February 2011). "Saudi women protest, web activists call for reform". Swiss Info. Reuters. Archived from the original on 16 February 2011. Retrieved 16 February 2011. ^ a b c d "Voters register for Saudi municipal elections". Al Jazeera. 23 April 2011. Archived from the original on 25 April 2011. Retrieved 25 April 2011. ^ a b c d e al-Huwaider, Wajeha (23 May 2011). "The Saudi woman who took to the driver's seat". France 24. Archived from the original on 23 May 2011. Retrieved 23 May 2011. ^ "Corruption in Saudi Arabia's Government reaches All Time Highs". Islam Times. 1 December 2009. Retrieved 14 July 2012. ^ Kawach, Nadim (17 April 2011). "Saudi public sector hit by corruption". Emirates 24/7. Archived from the original on 14 July 2012. Retrieved 14 July 2012. ^ "Saudi protests against unemployment". Al-Ahram. Reuters. 9 January 2011. Archived from the original on 14 July 2012. Retrieved 14 July 2012. ^ Alsharif, Asma; Jason Benham (10 April 2011). "Saudi unemployed graduates protest to demand jobs". Reuters. Archived from the original on 14 July 2012. Retrieved 14 July 2012. ^ a b al-Alawi, Irfan (1 April 2011). "Saudi Arabia's anti-protest fatwa is transparent". The Guardian. Archived from the original on 2 April 2011. Retrieved 2 April 2011. ^ Jansen, Michael (19 March 2011). "Saudi king announces huge spending to stem dissent". The Irish Times. Retrieved 3 April 2011. ^ al-Saeri, Muqbil (March 2011). "A talk with Peninsula Shield force commander Mutlaq Bin Salem al-Azima". Asharq al-Awsat. Archived from the original on 29 March 2011. Retrieved 29 March 2011. ^ a b c "Saudi Shi'ites protest, support Bahrain brethren". Reuters. 16 March 2011. Archived from the original on 17 March 2011. Retrieved 17 March 2011. ^ Benham, Jason (25 March 2011). "Hundreds of Saudi Shi'ites protest in east". Reuters. Archived from the original on 25 March 2011. Retrieved 25 March 2011. ^ "Al-Nimr's death sentence triggers protest". yementimes.com. ^ a b c d Cockburn, Patrick (5 October 2011). "Saudi Police open fire on civilians". The Independent. Archived from the original on 15 January 2012. Retrieved 15 January 2012. ^ "Two die during Saudi Arabia protest at Shia cleric arrest". 9 July 2012 – via www.bbc.co.uk. ^ "Saudis begin nationwide mosque sit-in". Press TV. 23 December 2011. Archived from the original on 17 January 2012. Retrieved 18 January 2012. ^ a b c d "Saudi Arabia: Arrests for Peaceful Protest on the Rise". Human Rights Watch. 27 March 2011. Archived from the original on 31 March 2011. Retrieved 31 March 2011. ^ a b c al-Suhaimy, Abeed (23 March 2011). "Saudi Arabia announces municipal elections". Asharq al-Awsat. Archived from the original on 2 April 2011. Retrieved 2 April 2011. ^ a b c Abu-Nasr, Donna (28 March 2011). "Saudi Women Inspired by Fall of Mubarak Step Up Equality Demand". Bloomberg. Archived from the original on 2 April 2011. Retrieved 2 April 2011. ^ "Saudis vote in municipal elections, results on Sunday". Oman Observer. AFP. 30 September 2011. Archived from the original on 14 December 2011. Retrieved 14 December 2011. ^ Alsharif, Asma (8 August 2012). "Saudi authorities crack down on rights campaigners: activists". Reuters. Archived from the original on 14 August 2012. Retrieved 14 August 2012. ^ a b Ottaway, David B. (3 August 2012). "Saudi Arabia's Race Against Time" (PDF). Woodrow Wilson International Center for Scholars. Archived from the original on 14 August 2012. Retrieved 14 August 2012. ^ Rosie Bsheer (7 May 2012). "Saudi Revolutionaries: An Interview". Jadaliyya. Retrieved 12 November 2012. ^ a b c d e f g h "Saudi-Arabiens Mächtige werden nervös". Handelsblatt (in German). DPA. 2 March 2011. Archived from the original on 5 March 2011. Retrieved 3 March 2011. ^ a b c d e f g h i j k l "Report: Saudi Facebook activist planning protest shot dead". Monsters and Critics. DPA. 2 March 2011. Archived from the original on 2 March 2011. Retrieved 2 March 2011. ^ a b c d e Bustamante, Tom (2 March 2011). "Iraq Oil Refinery Attack Shows Need for EarthSearch (ECDC) Systems". Wall Street Newscast. Archived from the original on 2 March 2011. Retrieved 2 March 2011. ^ Matthiesen, Toby (23 January 2012). "Saudi Arabia: the Middle East's most under-reported conflict". The Guardian. Archived from the original on 23 January 2012. Retrieved 23 January 2012. ^ a b c "Several injured in Saudi Arabia protest". Press TV. March 2011. Archived from the original on 18 March 2011. Retrieved 18 March 2011. ^ a b c "Kuwait Navy set for Bahrain - Saudi Shias Rally". Arab Times. 18 March 2011. Archived from the original on 19 March 2011. Retrieved 19 March 2011. ^ a b E, Sara (6 March 2011). "Saudi Facebook Administrator Faisal Ahmed Abdul-Ahadwas reportedly shot as Saudi Arabia bans protests ahead of its Day of Rage". EU-digest. Archived from the original on 9 March 2011. Retrieved 9 March 2011. ^ "Saudi police wound 3 Shiite protesters: witness". France 24. AFP. 10 March 2011. Archived from the original on 10 March 2011. Retrieved 10 March 2011. ^ "Saudi police break up protest outside Riyadh interior ministry". International Business Times. 21 March 2011. Archived from the original on 21 March 2011. Retrieved 21 March 2011. ^ Chulov, Martin (21 March 2011). "Egyptians endorse reforms but Arab discontent simmers". The Guardian. Archived from the original on 21 March 2011. Retrieved 21 March 2011. ^ "Women remain barred from voting as Saudi Arabia announces elections". The National. AP/Bloomberg. 23 March 2011. Archived from the original on 22 March 2011. Retrieved 22 March 2011. ^ a b "Man dies after setting himself on fire in Saudi Arabia". BBC News. 23 January 2011. Archived from the original on 23 January 2011. Retrieved 23 January 2011. ^ a b "Flood sparks rare action". The Gazette. 29 January 2011. Archived from the original on 1 February 2011. Retrieved 29 January 2011. ^ a b c "Dozens detained in Saudi over flood protests". The Peninsula. Qatar. Reuters. 29 January 2011. Archived from the original on 31 January 2011. Retrieved 31 January 2011. ^ a b "Anti-govt. protests hit S Arabia cities". Press TV. 5 March 2011. Archived from the original on 5 March 2011. Retrieved 3 March 2011. ^ a b c d e Laessing, Ulf; Matthew Jones (5 March 2011). "Saudi Arabia says won't tolerate protests". Reuters. Archived from the original on 5 March 2011. Retrieved 3 March 2011. ^ a b c Spencer, Richard; James Kirkup; Nabila Ramdani (21 February 2011). "Libya: Muammar Gaddafi's regime on the brink of collapse". The Daily Telegraph. Archived from the original on 22 February 2011. Retrieved 22 February 2011. ^ a b "Middle East unrest: Saudi and Bahraini kings offer concessions". The Guardian. 23 February 2011. Archived from the original on 2 March 2011. Retrieved 24 February 2011. ^ a b c d Banerjee, Neela (11 March 2011). "Saudi Arabia 'day of rage' protest fizzles". Los Angeles Times. Archived from the original on 11 March 2011. Retrieved 11 March 2011. ^ a b c d Kennedy, Dana (8 April 2011). "Imprisoned Father of Autistic Boy Called 'the Bravest Man in Saudi Arabia'". AOL News. Archived from the original on 6 June 2011. Retrieved 6 June 2011. ^ a b Buchanan, Michael (24 May 2011). "Saudi Arabia: Calls for political reform muted". BBC. Archived from the original on 6 June 2011. Retrieved 6 June 2011. ^ a b "Saudis stage protest rally in Riyadh". Press TV. 5 April 2011. Archived from the original on 6 April 2011. Retrieved 6 April 2011. ^ a b Alsharif, Asma; Jason Benham (10 April 2011). "Saudi unemployed graduates protest to demand jobs". Reuters. Archived from the original on 12 April 2011. Retrieved 12 April 2011. ^ a b "Scuffles break out as teachers protest for job stability, higher wages". Arab News. 11 April 2011. Archived from the original on 12 April 2011. Retrieved 12 April 2011. ^ a b "Saudi police break up rare Riyadh demo". Press TV. Ahlul Bayt News Agency. 14 January 2012. Archived from the original on 16 January 2012. Retrieved 16 January 2012. ^ Cowburn, Ashley (2 January 2016). "Sheikh Nimr al-Nimr profile: A 'holy warrior' who called for elections in Saudi Arabia". The Independent. Retrieved 3 May 2017. ^ a b c "Shia Muslims protest in eastern Saudi Arabia". International Business Times. 16 April 2011. Archived from the original on 17 April 2011. Retrieved 17 April 2011. ^ a b "Saudis stage protest in Qatif". Press TV. 9 May 2011. Archived from the original on 8 May 2011. Retrieved 9 May 2011. ^ a b "Saudis denounce Bahrain occupation". Press TV. 13 May 2011. Archived from the original on 14 May 2011. Retrieved 14 May 2011. ^ a b "Saudis show solidarity with Bahrainis". Press TV. 20 May 2011. Archived from the original on 22 May 2011. Retrieved 22 May 2011. ^ a b Benham, Jason (17 March 2011). "Saudi Shi'ites call for Bahrain troop withdrawal". Reuters. Archived from the original on 17 March 2011. Retrieved 17 March 2011. ^ Abul-Samh, Rashid (13 October 2011). "Saudi Shias riot yet again for better conditions". Al-Ahram Weekly. Archived from the original on 22 February 2012. Retrieved 22 February 2012. ^ a b c d e f g h i "Saudi Arabia: Renewed Protests Defy Ban". Human Rights Watch. 30 December 2011. Archived from the original on 7 January 2012. Retrieved 7 January 2012. ^ a b c d e f "Saudi forces clash with protesters in Qatif". Al Jazeera. 13 January 2012. Archived from the original on 14 January 2012. Retrieved 14 January 2012. ^ a b c "Shia protester 'shot dead' in Saudi Arabia". BBC News. 13 January 2012. Archived from the original on 14 January 2012. Retrieved 14 January 2012. ^ a b c d e "Saudi forces kill another protester". Press TV. 27 January 2012. Archived from the original on 27 January 2012. Retrieved 27 January 2012. ^ a b c d "Saudi crackdown kills one, injures 14". Press TV. 9 February 2012. Archived from the original on 9 February 2012. Retrieved 9 February 2012. ^ a b c d e إستشهاد الشاب منير الميداني برصاص القوات السعودية (in Arabic). Awamia.com. 9 February 2012. Archived from the original on 9 February 2012. Retrieved 9 February 2012. ^ a b c d e f g "New clashes in Saudi Arabia leave 'protester' dead". BBC News. 13 February 2012. Archived from the original on 13 February 2012. Retrieved 14 February 2012. ^ a b c شرق السعودية يشهد حداداً عاماً وموجة غضب اثر استشهاد شابين (in Arabic). Awamia.com. 11 February 2012. Archived from the original on 13 February 2012. Retrieved 14 February 2012. ^ a b "Thousands people escorted the Shi'a martyr Issam Abu Abdullah". CDHRAP. 17 January 2012. Archived from the original on 19 January 2012. Retrieved 15 January 2012. ^ a b "Saudis hold anti-regime demo in Qatif". Press TV. 19 January 2012. Archived from the original on 19 January 2012. Retrieved 19 January 2012. ^ a b c Hill, Jess (24 February 2012). "The Growing Rebellion in Saudi Arabia". The Global Mail. Archived from the original on 26 February 2012. Retrieved 26 February 2012. ^ a b c Merza, Nour; Sami Aboudi; Myra MacDonald (10 February 2012). "UPDATE 1-Police kill protester in Eastern Saudi Arabia-activists". Reuters. Archived from the original on 10 February 2012. Retrieved 10 February 2012. ^ a b Al Sharif, Asma; Angus McDowall; Sami Aboudi; Christopher Wilson (8 July 2012). "Saudi police arrest prominent Shi'ite Muslim cleric". Reuters. Archived from the original on 10 July 2012. Retrieved 10 July 2012. ^ a b c d e f "Saudi protest crackdown leaves two dead". Al Jazeera. 9 July 2012. Archived from the original on 10 July 2012. Retrieved 10 July 2012. ^ a b c d e HSN/HJL (9 July 2012). "Saudi regime forces kill three demonstrators in Eastern Province". Press TV. Archived from the original on 10 July 2012. Retrieved 10 July 2012. ^ a b "Saudi protesters hold massive anti-regime rally in Qatif". CDHRAP. 11 July 2012. Archived from the original on 13 July 2012. Retrieved 13 July 2012. ^ a b c d DB/MA/AZ (14 July 2012). "Young protester shot dead by Saudi forces in Awamiyah". Press TV. Archived from the original on 14 July 2012. Retrieved 14 July 2012. ^ a b Aboudi, Sami; Asma al-Sharif; Ralph Boulton; Kevin Liffey (11 July 2012). "Saudi Shi'ites throng funeral of slain protester". Reuters. Archived from the original on 13 July 2012. Retrieved 13 July 2012. ^ a b 1ASH/HMV/IS (12 July 2012). "Saudi regime's power in decline: Analyst". Press TV. Archived from the original on 13 July 2012. Retrieved 13 July 2012. ^ a b HM/JR/SS (13 July 2012). "Saudi protesters rally in Qatif to demand release of Shia cleric". Press TV. Archived from the original on 13 July 2012. Retrieved 13 July 2012. ^ a b Aboudi, Sami; Asma al-Sharif; Andrew Hammond; Ralph Boulton; Kevin Liffey (11 July 2012). "Saudi Shi'ites throng funerals of slain protesters". Reuters. Archived from the original on 13 July 2012. Retrieved 13 July 2012. ^ a b "Saudi Shia protesters mourned by 'thousands'". Al Jazeera. 12 July 2012. Archived from the original on 13 July 2012. Retrieved 13 July 2012. ^ a b "Sheikh Nimr Tortured by Saudi Authorities". Al-Manar. 17 July 2012. Archived from the original on 18 July 2012. Retrieved 18 July 2012. ^ a b "Saudi Arabia's jailed Sheikh Nemr goes on hunger strike". Press TV. 19 July 2012. Archived from the original on 19 July 2012. Retrieved 19 July 2012. ^ a b بيان : الحراك الرسالي يحث على المشاركة الفاعلة في مسيرة 'كلنا نمور' الليلة (in Arabic). Awamia.net. 26 July 2012. Archived from the original on 26 July 2012. Retrieved 26 July 2012. ^ a b السلطات تمنع تشييع عقيلة آية الله النمر والآلاف يخرجون في مسيرة غاضبة (in Arabic). Awamia.net. 1 August 2012. Archived from the original on 1 August 2012. Retrieved 1 August 2012. ^ a b c d "Deaths in clash after Saudi rights protest". Al Jazeera. 4 August 2012. Archived from the original on 4 August 2012. Retrieved 4 August 2012. ^ a b الآلاف يزفون الشهيد القلاف إلى مثواه الأخير (in Arabic). Awamia.net. 6 August 2012. Archived from the original on 7 August 2012. Retrieved 14 August 2012. ^ a b HSN/MA/HJL (6 August 2012). "Saudi protesters hold anti-regime demo in Tarout Island". Press TV. Archived from the original on 14 August 2012. Retrieved 14 August 2012. ^ a b AO/HN/HJL (7 August 2012). "Saudi protesters hold anti-regime rallies in Qatif". Press TV. Archived from the original on 14 August 2012. Retrieved 14 August 2012. ^ a b "Saudi Arabia's political prisoners: towards a third decade of silence" (PDF). Islamic Human Rights Commission. 30 September 2011. Archived from the original (PDF) on 2 February 2012. Retrieved 2 February 2012. ^ "Saudi protest ends with arrests". Al Jazeera. 21 March 2011. Archived from the original on 21 March 2011. Retrieved 21 March 2011. ^ a b HSN/JR/IS (14 July 2012). "Saudi protesters hold anti-regime demonstration in Buraydah". Press TV. Archived from the original on 14 July 2012. Retrieved 14 July 2012. ^ a b AGB/MA (15 July 2012). "Saudi Arabia arrests 10 women protesters in Buraydah". Press TV. Archived from the original on 15 July 2012. Retrieved 15 July 2012. ^ a b MRS/JR/IS (24 July 2012). "Saudi protesters call for immediate release of prisoners". Press TV. Archived from the original on 24 July 2012. Retrieved 24 July 2012. ^ a b "Saudi protesters call for release of political prisoners". Press TV. 25 July 2012. Archived from the original on 26 July 2012. Retrieved 26 July 2012. ^ a b "Saudi anti-regime protesters stage rallies in Riyadh, Mecca". Press TV. 29 July 2012. Archived from the original on 29 July 2012. Retrieved 30 July 2012. ^ a b AGB/MA/AZ (10 August 2012). "Saudi protesters call for prisoners' release". Press TV. Archived from the original on 14 August 2012. Retrieved 14 August 2012. ^ a b MN/MA (17 July 2012). "Saudis hold anti-regime demonstrations". Press TV. Archived from the original on 17 August 2012. Retrieved 17 August 2012. ^ a b al-Qahtani, Mohammad Fahad (13 August 2012). "Mohammad Al-Qahtani". Twitter. Archived from the original on 19 August 2012. Retrieved 19 August 2012. ^ a b al-Qahtani, Mohammad Fahad (19 August 2012). "Mohammad Al-Qahtani". Twitter. Archived from the original on 19 August 2012. Retrieved 19 August 2012. ^ a b c d Shaheen, Abdul Nabi (26 April 2011). "Saudi women defy ban to register for polls". Gulf News. Archived from the original on 25 April 2011. Retrieved 25 April 2011. ^ a b Al-Shihri, Abdullah (21 May 2011). "Manal al-Sherif, Saudi Woman, Detained For Defying Driving Ban". Huffington Post. Associated Press. Archived from the original on 23 May 2011. Retrieved 23 May 2011. ^ a b al-Omran, Ahmed (29 September 2011). "Reports: Saudi King Cancels Lashing Sentence Against Woman Who Drove". NPR. Archived from the original on 13 January 2012. Retrieved 13 January 2012. ^ a b Dolan, Kerry A. (28 September 2011). "Saudi King Revokes Lashing Punishment For Woman Driver". Forbes. Archived from the original on 13 January 2012. Retrieved 13 January 2012. ^ a b Metz, Helen Chaplin (1992). "The Legal System". Saudi Arabia: A Country Study. United States Library of Congress. Retrieved 24 February 2012. ^ a b "Saudi women launch legal fight against driving ban". The Daily Telegraph. Agence France-Presse. 6 February 2012. Archived from the original on 7 February 2012. Retrieved 7 February 2012. ^ a b "Fifty injured in attack on Saudi student protest: report". Al Akhbar. 7 March 2012. Archived from the original on 8 March 2012. Retrieved 8 March 2012. ^ a b c d "Female student killed in Saudi Arabian city of Abha". Press TV. 8 March 2012. Archived from the original on 8 March 2012. Retrieved 8 March 2012. ^ a b c McMahon, Felim; Wael Abdullah (10 March 2012). "Campus revolt: Saudis demand #KKU regime change". Storyful. Archived from the original on 11 March 2012. Retrieved 12 March 2012. ^ a b "Saudi Arabia: Student and citizen die in protests". Arab Network for Human Rights Information. 13 March 2012. Archived from the original on 13 March 2012. Retrieved 13 March 2012. ^ a b "Female students protest 'poor conditions' at Tabuk University". Saudi Gazette. 10 April 2012. Archived from the original on 10 May 2012. Retrieved 11 May 2012. ^ a b Anabtawi, Sara (10 April 2012). "Saudi females protest over learning conditions". Arabian Business. Archived from the original on 10 May 2012. Retrieved 11 May 2012. ^ Awad, Ammar (23 February 2011). "Protests continue across the Arab world". Toronto Star. Associated Press. Archived from the original on 24 February 2011. Retrieved 24 February 2011. ^ a b c "ACPRA demands the immediate unconditional release of its co-founder, Mohammed Al-Bjady". Saudi Civil and Political Rights Association. March 2011. Archived from the original on 24 March 2011. Retrieved 24 March 2011. ^ a b c "Human Rights First Society – Human Rights Monitoring and Advocacy in Saudi Arabia". Human Rights First Society. March 2011. Archived from the original on 24 March 2011. Retrieved 24 March 2011. ^ "Five Saudi women drivers arrested, says activist". The Guardian. Associated Press. 29 June 2011. Archived from the original on 13 January 2012. Retrieved 13 January 2012. ^ Stewart, Catrina (23 May 2011). "Saudi woman arrested after defying driving ban". The Independent. Archived from the original on 23 May 2011. Retrieved 23 May 2011. ^ Toumi, Habib (5 June 2011). "Saudi actress Rahbini took driving lessons from husband". Gulf News. Archived from the original on 5 June 2011. Retrieved 5 June 2011. ^ a b Burke, Jason (17 June 2011). "Saudi Arabia women test driving ban". The Guardian. Archived from the original on 19 June 2011. Retrieved 19 June 2011. ^ a b al-Nafjan, Eman (29 June 2011). "Saudi women driving movement". Archived from the original on 13 January 2012. Retrieved 13 January 2012. ^ a b Khan, Muna (20 June 2011). "Highway to Nowhere. Why is it so hard to give the wheel to women?". Al Arabiya. Archived from the original on 13 January 2012. Retrieved 13 January 2012. ^ a b c d e "Saudi security forces 'fire on protesters'". Al Jazeera. 22 November 2011. Archived from the original on 13 January 2012. Retrieved 14 January 2012. ^ a b c al-Khoei, Hayder (28 November 2011). "Deadly shootings in Saudi Arabia, but Arab media look the other way". The Guardian. Archived from the original on 13 January 2012. Retrieved 14 January 2012. ^ a b c d e f g "Two Shot Dead in Renewed Shiite Protests in Saudi". CDHRAP. Agence France-Presse. 24 November 2011. Archived from the original on 13 January 2012. Retrieved 14 January 2012. ^ "KSA forces open fire on Qatif protesters". Press TV. 30 December 2011. Archived from the original on 7 January 2012. Retrieved 7 January 2012. ^ al-Tamimi, Omar (14 February 2012). "The Hamza I Know". Mashallah News. Archived from the original on 19 February 2012. Retrieved 19 February 2012. ^ SZH/JR (18 May 2012). "Saudi Arabians hold anti-regime rally in Eastern Province". Press TV. Archived from the original on 10 July 2012. Retrieved 10 July 2012. ^ "Cameron visits despotic Saudi friends". Press TV. 12 January 2012. Archived from the original on 13 January 2012. Retrieved 13 January 2012. ^ "Saudis protesters demand release of political prisoners". Press TV. 13 April 2012. Archived from the original on 24 April 2012. Retrieved 24 April 2012. ^ a b "Saudi authorities detained a Syrian doctor works in a governmental clinic". CDHRAP. 15 February 2012. Archived from the original on 16 February 2012. Retrieved 23 January 2012. ^ "Shi'a citizens held two peaceful protests in Tarout and Sihat". CDHRAP. 19 January 2012. Archived from the original on 21 January 2012. Retrieved 20 January 2012. ^ "Case Study: Dawoud Al Marhoon". Reprieve. ^ "Saudi Arabia: Fears grow that three young activists could soon be executed". Amnesty International. 16 October 2015. Retrieved 3 May 2017. ^ Paul, Katie; McDowall, Angus. "Saudi Arabia to execute more than 50 convicted of terrorism, local media say". The Sydney Morning Herald. Retrieved 3 May 2017. ^ Abu-Nasr, Donna (29 June 2012). "Saudi Women Drive on Anniversary of Campaign to End Ban". Bloomberg. Archived from the original on 13 July 2012. Retrieved 13 July 2012. ^ "Saudi Arabia: Punish human rights violators not human rights defenders: Oral intervention at the UN Human Rights Council 20th Session". Amnesty International. 3 July 2012. Retrieved 13 July 2012. ^ al-Qahtani, Mohammad Fahad (18 August 2012). "Mohammad Al-Qahtani". Twitter. Archived from the original on 19 August 2012. Retrieved 19 August 2012. ^ "Saudi police fire on Shiite protest: witnesses". France 24. Agence France-Presse. 27 July 2012. Archived from the original on 27 July 2012. Retrieved 27 July 2012. ^ AGB/MA/AZ (3 August 2012). "Saudis rally to call for release of teenage protester". Press TV. Archived from the original on 3 August 2012. Retrieved 3 August 2012. ^ "Reporting Saudi Arabia's hidden uprising". BBC News. 30 May 2014. Archived from the original on 15 October 2014. Retrieved 2014-10-15. ^ a b "Saudi Shia cleric Nimr al-Nimr 'sentenced to death'". BBC News. 15 October 2014. Archived from the original on 15 October 2014. Retrieved 2014-10-15. ^ "Saudi Arabia: Appalling death sentence against Shi'a cleric must be quashed". Amnesty International. 15 October 2014. Archived from the original on 15 October 2014. Retrieved 15 October 2014. ^ "Saudi announces execution of 47 'terrorists'". Al Jazeera. Retrieved 2 January 2016. ^ Gfoeller, Michael (23 August 2008). "Meeting with controversial Shi'a sheikh Nimr". WikiLeaks. WikiLeaks cable: 08RIYADH1283. Archived from the original on 23 January 2012. Retrieved 23 January 2012. ^ "Saudi execution of Shia cleric sparks outrage in Middle East". The Guardian. 2 January 2016. ^ "Saudi soldier killed as eastern province unrest continues". The Naw Arab. 16 May 2017. Retrieved 6 October 2017. ^ "Pakistani worker, Saudi minor killed in Qatif terror attack". Dunya News TV. 13 May 2017. Retrieved 6 October 2017. ^ "At least five dead during Saudi security operation in Qatif: activists". Reuters. Retrieved 5 July 2018. ^ "Saudi State Security: Fugitive Killed in Security Operation in Qatif | Asharq AL-awsat". Aawsat.com. 16 January 2018. Retrieved 5 July 2018. ^ "Saudi soldier killed in Qatif province, Al Arabiya reports". The National. 8 April 2018. Retrieved 22 April 2018. 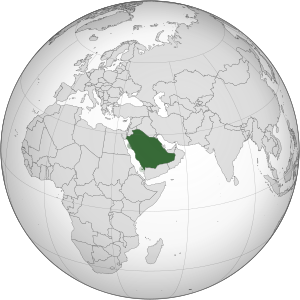 ^ "Saudi Arabia: 2 gunmen killed in predominantly Shiite region". WTOP-FM/AP. 9 April 2019. Archived from the original on 24 April 2019. Retrieved 24 April 2019. ^ "Protester killed in Saudi eastern Shiite region". Al-Ahram. Agence France-Presse. 22 November 2011. Archived from the original on 13 January 2012. Retrieved 14 January 2012. ^ "Saudi forces crackdown protests in Qatif and kill a protester – Rasid News Network". Rasid.com. Archived from the original on 21 February 2013. Retrieved 20 October 2012. ^ "Two more killed in Shiite protest in Saudi Arabia". MOLE.my. 24 November 2011. Archived from the original on 5 October 2012. Retrieved 20 October 2012. ^ "MPs question Saudi arms contracts". London Evening Standard. London. 13 January 2012. Archived from the original on 13 January 2012. Retrieved 13 January 2012. ^ a b "Saudi Wahhabi Security Forces Martyred Two Peaceful Protesters in East + pic". Ahlul Bayat News Agency. 12 February 2012. Archived from the original on 13 February 2012. Retrieved 14 February 2012. ^ a b Hammond, Andrew; Sami Aboudi; Ralph Boulton (9 May 2012). "Saudi Arabia says two killed after cleric's arrest". Reuters. Archived from the original on 10 July 2012. Retrieved 10 July 2012. ^ a b "Pictures of Qatif martyrs killed by the Saudi regime including funeral". Shafaqna. 10 May 2012. Archived from the original on 11 July 2012. Retrieved 11 July 2012. ^ a b "Saudi protester killed in latest unrest". Bikya Masr. 14 July 2012. Archived from the original on 21 February 2013. Retrieved 15 July 2012. ^ a b c القطيف: استشهاد الشاب حسين القلاف برصاص القوات السعودية (in Arabic). Awamia.net. 3 August 2012. Archived from the original on 4 August 2012. Retrieved 4 August 2012. ^ a b "Teenage protester shot dead in Saudi Arabia's Qatif". Press TV. 4 August 2012. Archived from the original on 4 August 2012. Retrieved 4 August 2012. ^ a b "Two killed as Saudi security forces try to arrest Shi'ite man". Reuters. 27 September 2012. Retrieved 20 October 2012. ^ "Riyadh Bureau – Deaths Fuel Protest Movement in Restive Qatif". Riyadhbureau.com. Archived from the original on 1 February 2013. Retrieved 20 October 2012. ^ a b "Saudi teenager, activist killed by security forces in Qatif". Press TV. 26 September 2012. Archived from the original on 12 October 2012. Retrieved 20 October 2012. ^ "العوامية على الشبكة – السلطات تعتقل خالد اللباد بعد إصابته بطلقات نارية بليغة وأنباء عن حالة استشهاد". Awam203.homeip.net. 26 September 2012. Archived from the original on 16 October 2013. Retrieved 20 October 2012. ^ a b c "Two killed in clash with Saudi security forces". CNN. 27 September 2012. Retrieved 20 October 2012. ^ "PressTV – Saudi teenager, activist killed by security forces in Qatif". Press TV. 26 September 2012. Archived from the original on 29 October 2012. Retrieved 20 October 2012. ^ a b "PressTV – Saudi teenager injured by regime forces dies". Press TV. 29 September 2012. Archived from the original on 2 November 2012. Retrieved 20 October 2012. ^ a b c "شبكة راصد الإخبارية". Rasid.com. Archived from the original on 27 November 2012. Retrieved 20 October 2012. ^ a b "Questions Over Death of Protester In Saudi Arabia's Eastern Province". 24 January 2013. ^ a b "Another Young Man Shot Dead in Qatif - Saudi Shia". Archived from the original on 28 July 2013. ^ a b "PressTV – Saudi forces kill teenage boy in Qatif". Archived from the original on 13 July 2013. Retrieved 22 June 2013. ^ a b "Shi'ite man shot dead in Saudi Arabia". Reuters. 22 June 2013. ^ a b al-Khatarish, Abdul Rahman; Muhammad Makki (6 August 2012). "I'm proud my son died a martyr". Saudi Gazette. Archived from the original on 14 August 2012. Retrieved 14 August 2012. ^ "Man dies after setting himself on fire in Saudi Arabia". BBC. 23 January 2011. Retrieved 20 October 2012. ^ PM/AS/HN (23 November 2011). "1000s of Saudis rally against regime". Press TV. Archived from the original on 27 November 2011. Retrieved 10 July 2012. ^ "Bangladeshi man shot dead in Shi'ite area of Saudi Arabia- swissinfo". Swissinfo.ch. 11 September 2012. Archived from the original on 24 October 2012. Retrieved 20 October 2012. ^ Laessing, Ulf (10 February 2011). "Pro-reform Saudi activists launch political party". Reuters. Archived from the original on 11 February 2011. Retrieved 11 February 2011. ^ a b "Saudi authorites [sic] detain founders of new party". The Washington Post. 18 February 2011. Archived from the original on 22 February 2011. Retrieved 19 February 2011. ^ "Saudi king announces new benefits". Al Jazeera. 23 February 2011. Archived from the original on 24 February 2011. Retrieved 23 February 2011. ^ Council of Senior Scholars of the Kingdom of Saudi Arabia (6 March 2011). "A fatwa from the Council of Senior Scholars in the Kingdom of Saudi Arabia warning against mass demonstrations". Islamopediaonline. Archived from the original on 2 April 2011. Retrieved 2 April 2011. ^ a b "Saudi Arabia prints 1.5m copies of religious edict banning protests". The Guardian. 29 March 2011. Archived from the original on 2 April 2011. Retrieved 2 April 2011. ^ "Saudi Arabia to hold elections next month after year and a half delay". The Star. Associated Press. 22 March 2011. Archived from the original on 22 March 2011. Retrieved 22 March 2011. ^ a b Fisk, Robert (5 March 2011). "Saudis mobilise thousands of troops to quell growing revolt". The Independent. Archived from the original on 5 March 2011. Retrieved 3 March 2011. ^ "Thousands stage rally in Bahrain". Al Jazeera. 9 March 2011. Archived from the original on 10 March 2011. Retrieved 9 March 2011. ^ a b al-Sulami, MD; Walaa Hawari (3 January 2012). "Arrest warrants issued for 23 Qatif rioters". Arab News. Archived from the original on 7 January 2012. Retrieved 7 January 2012. ^ McDowall, Angus (2 January 2012). "Saudi Arabia seeks arrest of 23 Shi'ites for unrest". Reuters. Archived from the original on 7 January 2012. Retrieved 7 January 2012. ^ "Saudi Wahhabi Police Arrested Shi'a Citizen Shah Ali Al Shokan". Ahlul Bayat News Agency. 3 January 2012. Archived from the original on 7 January 2012. Retrieved 7 January 2012. ^ a b "Saudi Wahhabi Security Forces Arrested 5 Shi'a Citizens". Ahlul Bayat News Agency. 4 January 2012. Archived from the original on 7 January 2012. Retrieved 7 January 2012. ^ "Saudi security forces injured and arrested the Shia citizen Aqeel Al Yaseen". CDHRAP. 11 January 2012. Archived from the original on 12 January 2012. Retrieved 12 January 2012. ^ Laessing, Ulf; Crispian Balmer (24 March 2011). "Witness – Searching for reforms in King Abdullah's Saudi Arabia". Reuters. Archived from the original on 31 March 2011. Retrieved 31 March 2011. ^ CNN, Ben Brumfield, Yousuf Basil and Catherine E. Shoichet. "Saudi Arabia severs ties with Iran as protests rage". ^ "Russia "concerned" by Saudi oppression". Al Akhbar. Reuters. 15 July 2012. Archived from the original on 15 July 2012. Retrieved 15 July 2012. ^ Dolgov, K.K. (12 July 2012). "Comment of K. K. Dolgov, Representative on Human Rights, Democracy and the Rule of Law of the MFA of Russia, on situation in the Eastern province of Saudi Arabia". Ministry of Foreign Affairs. Archived from the original on 15 July 2012. Retrieved 15 July 2012. ^ "2012 International Women of Courage Award Winners". US Dept of State. 5 February 2012. Archived from the original on 9 March 2012. Retrieved 9 February 2012. ^ Homewood, Sarah (20 July 2012). "Pro-democracy protesters at Saudi embassy". The Canberra Times. Archived from the original on 22 July 2012. Retrieved 23 July 2012. ^ Consiglio, Alex (21 July 2012). "Protesters target US Consulate". Toronto Sun. Archived from the original on 22 July 2012. Retrieved 23 July 2012. ^ "Massive protests loom in Saudi Arabia". Press TV. 5 March 2011. Archived from the original on 5 March 2011. Retrieved 3 March 2011. ^ a b Hankir, Zahra (3 March 2011). "Dubai Stocks Extends Drop on Concern Mideast Unrest May Spread". Bloomberg. Retrieved 3 April 2011. ^ Regan, Michael P. (2 March 2011). "U.S. Stocks Rise on Job-Market Strength; Oil Jumps, Dollar Falls". Bloomberg. Retrieved 3 April 2011. ^ "Nobel laureates urge Saudi king to halt 14 executions". The Washington Post. 11 August 2017. Alrabaa, Sami (2010). Veiled Atrocities: True Stories of Oppression in Saudi Arabia. Amherst, NY: Prometheus Books. ISBN 978-1-61614-159-2. Al-Rasheed, Madawi (2007). Contesting the Saudi State: Islamic Voices from a New Generation. New York: Cambridge University Press. ISBN 0-521-85836-4. Hamzawy, Amr (2008). "The Saudi Labyrinth: Is There a Political Opening?". In Ottaway, Marina; Choucair-Vizoso, Julia (eds.). Beyond the Façade: Political Reform in the Arab World. Washington, DC: Carnegie Endowment for International Peace. pp. 187–210. ISBN 978-0-87003-239-4. Wikimedia Commons has media related to 2011–2012 Saudi Arabian protests. Saudi Arabia's Secret Uprising on YouTube and on BBC, documentary film, BBC, 2015, by Safa Al Ahmad.